Up and away at 8.30 under another clear blue sky. These bright days also mean clear nights with touches of frost, which worms its way into the boat in the small hours and causing us to haul an extra blanket on to keep us warm. 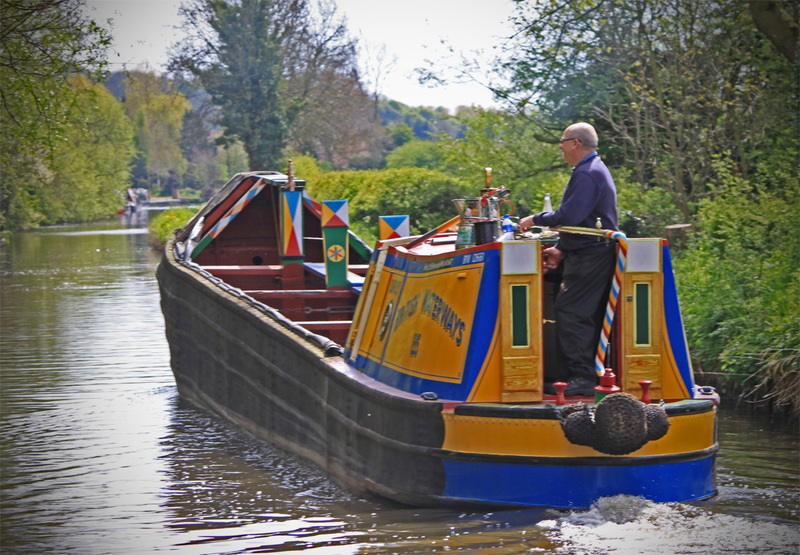 The procession of working boats continued to approach us from Fradley Junction and then we passed Nev's Waterlilly bobbing gently on her mooring. We were in need of some provisions and we knew that this route offered few opportunities to re stock so we paused in Alrewas, walking to the Co Op at the far end of the village. 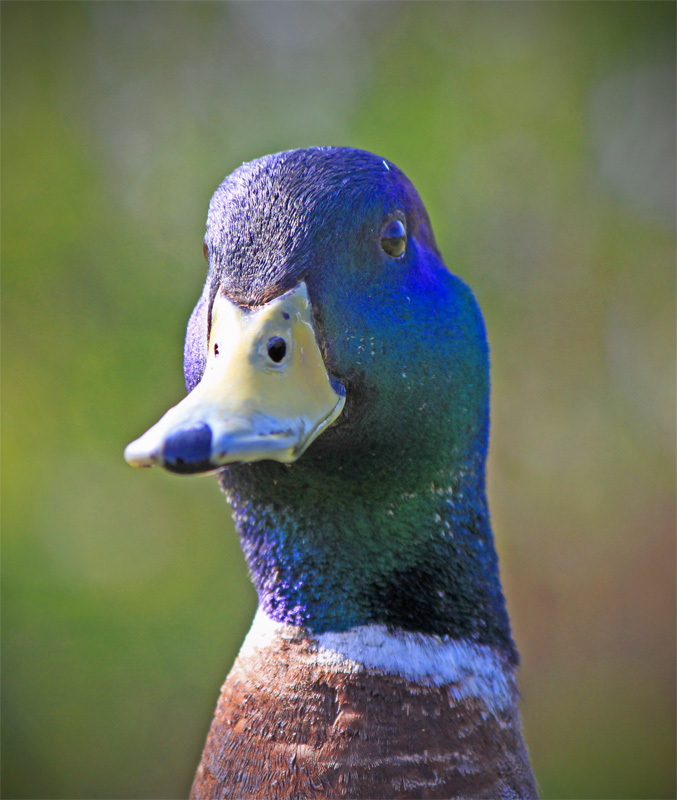 Belle has gone all Huge Fernleigh Wittingstall on me and is consumed with a passion to forage in the canal hedgerows. This time its Beech Leaf Noyau which involved a carrier bag of new beech leaves and copious quantities of Gin. Our Gin supplies were invested with the promise of "something special in the autumn when it has matured". I am no great advocate of deferred satisfaction. 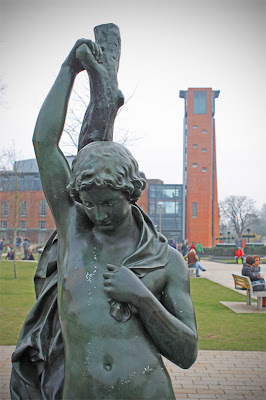 This route is dominated by transport links through the ages - First the Roman Road, then the River Trent for Norse invaders, then the canal, followed by the railway and finally a return to the road in the shape of the bustling A38. All the noise from the adjacent A38 destroys all semblance of tranquility and no one in their right mind moors anywhere near Barton Turns, apart from in the marina of course. We paused at Barton Turns, sampling the delights of Belle's home made soup on the new cooker accompanied by scrummy Leek and Cheese muffins. I like all this home cooked food! Beer arising like a Phoenix! The day was rounded off with a couple of pints of Phoenix ale from the Falstaff Brewery, sold by the Stenson Bubble. I feel sure that all those Shakespearean connections swayed Belle in her selection! We moored just before Swarkestone lock lulled to sleep by the rumble of the occasional diesel loco hauling heavy loads on the nearby tracks. 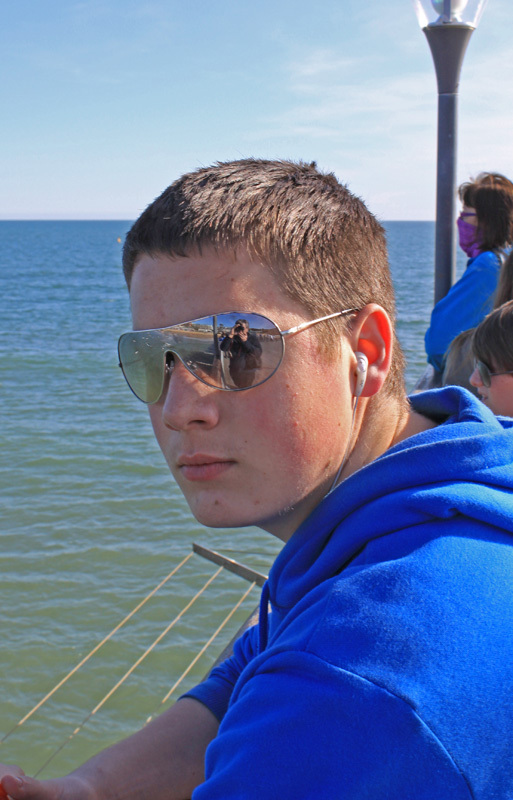 At last, a genuine cruising blog! Sorry for the lack of posts recently - what with a new job, a poorly wife and little canal time I havn't had a lot to say. Well that is all set to change. Gailey Roundhouse - gateway to the first cruise of the season. We had ten days available to us leading up to Easter and according to Nick's canal planner 12 days should comfortably see us round the Leicester Ring! My policy is: if the first answer isn't what you want you need to redefine the question. In this case it meant speeding the cruising speed to 3.5 mph and accept 9.5 hour cruising days and hey presto - it's a 10 day trip! Simples. With time a constant pressure we decamped to Wand'ring Bark on Friday evening, as soon as I got back from London. The weather forecast predicted dryish conditions, but a bit cold in the low teens so we packed accordingly with lots of fleeces and warm trousers. Not a wise move as things panned out. 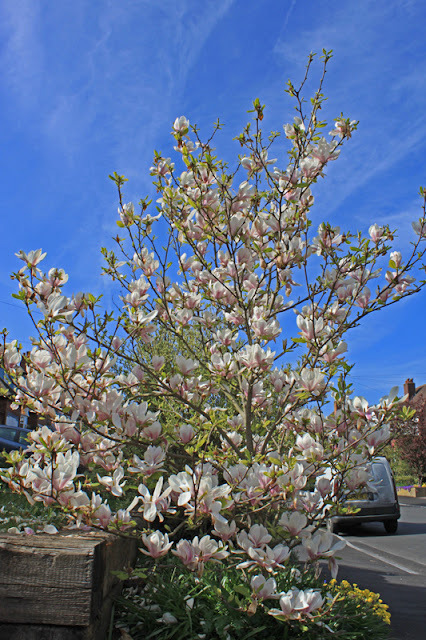 We awoke to a glorious spring morning with wall to wall sunshine beating down on us. 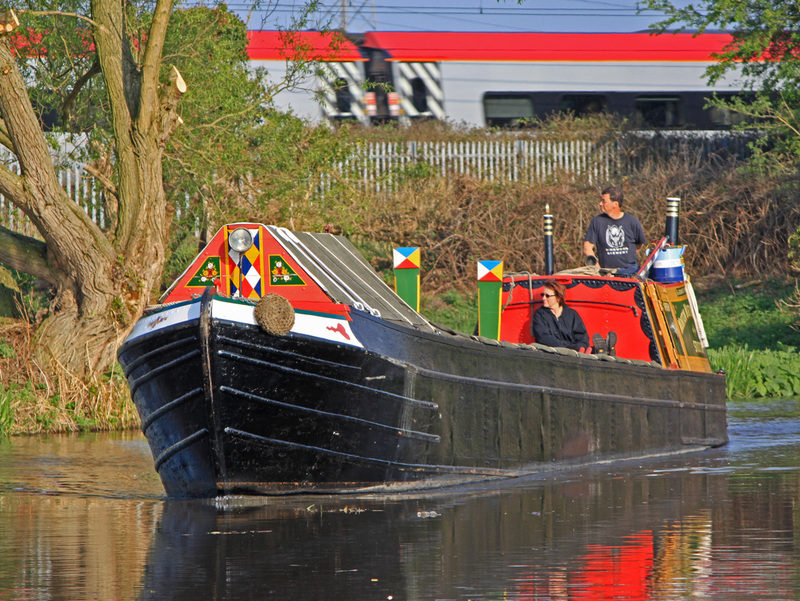 Easter weekend is one of the two historic boating rallies, the Easter one being at Ellesmere Port near Chester. With a week to go we passed a steady procession of much loved working boats, all making sedate progress in a north westerly direction. It was a veritable feast of old boats thump, thump, thumping their way along - kicking plumes of blue smoke into the clear spring air and stirring up the winter sediment of the Staffs and Worcester. All these boats gave me a great opportunity to test out my new telephoto lens. 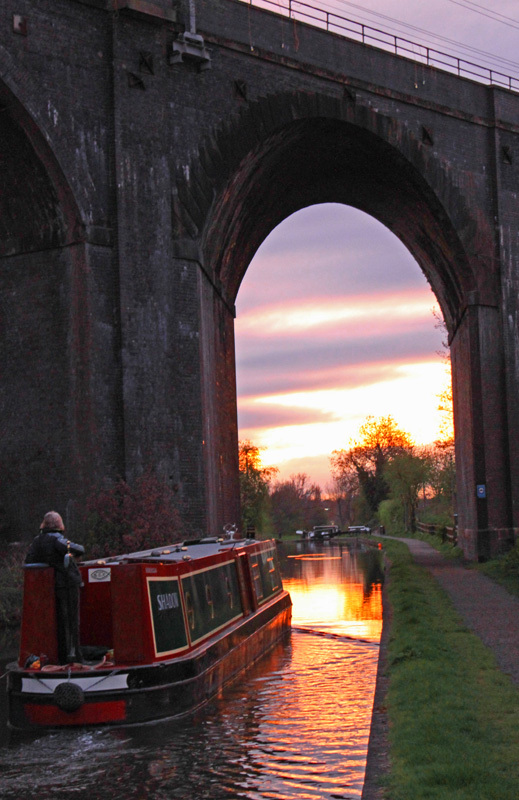 I am usually pretty considerate when passing moored boats but as I entered Penkridge a head popped out of an unnamed boat and said, ever so politely, "excuse me for being a pain, but you are travelling too fast, mush too fast". I wasn't aware of any excessive speed so replied with a diplomatic "do you think so?". But it got me thinking. 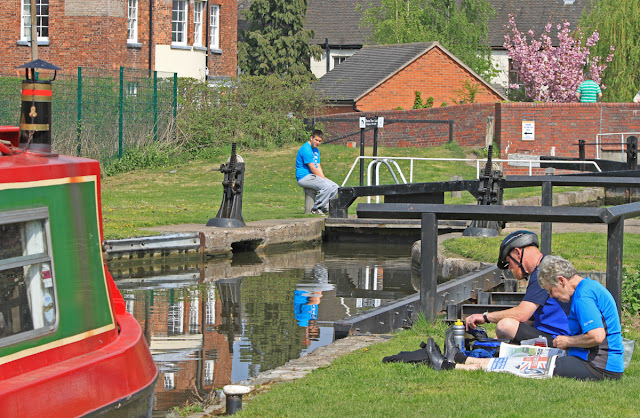 The only times I am ever accused of going too fast is on my first day aboard - so maybe he was right and I was having trouble slowing down to canal speed - or maybe he was a twonk. On reflection I suspect that he was more in the right than me. As we passed through Gt Haywood we spied the Cheese Boat, which sent Belle scurrying back armed with my wallet. Why is it always my wallet I wonder? After a goodly bit of sampling she selected three specialty cheeses which enhanced snack times all the way to Braunston. The Cheese Boat is a must visit if you see it wound the system. 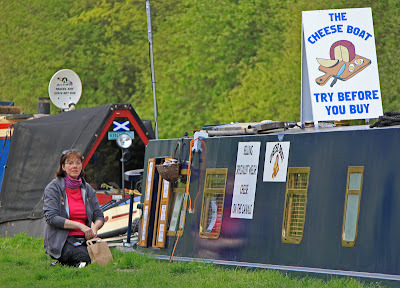 Welsh cheese sold by a Canadian on the English Waterways. I bet her careers advisor never identified that as a possible means of making a living! 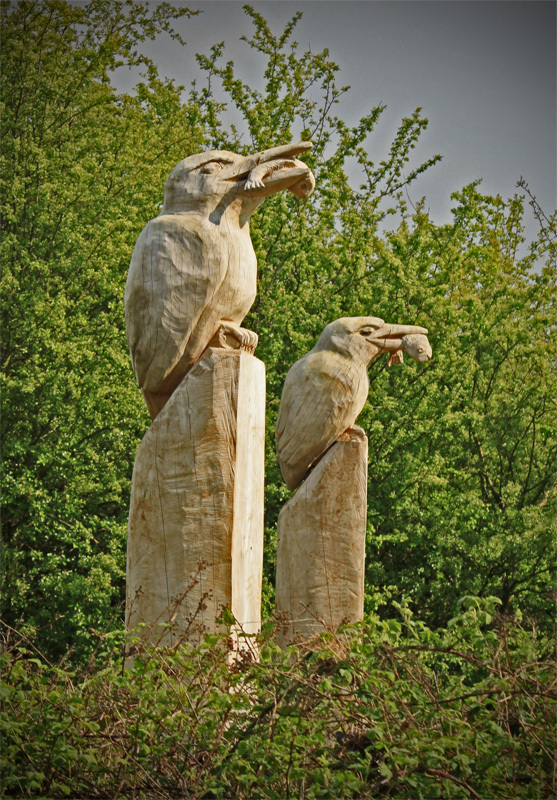 By 5.00pm we were getting a bit dry and spied the Ash Tree pub in Rugely. We extracted our take out plastic glasses and Belle went in search of liquid refreshment - armed with my wallet again! The beer was nothing special - standard Bank's but it really hit the spot after a long day's cruising. A take out at the Ash Tree pub - Ahab style! We stopped near a winding hole in Armitage. One day down and 1.5 hours up on the schedule. The boating season is finally upon us and preparations are being made for the first trip of the 2011 season. But we have a git of a snag - no cooker. I ripped out the old one before Christmas but with one thing and another I havn't managed to get the new one fitted in. 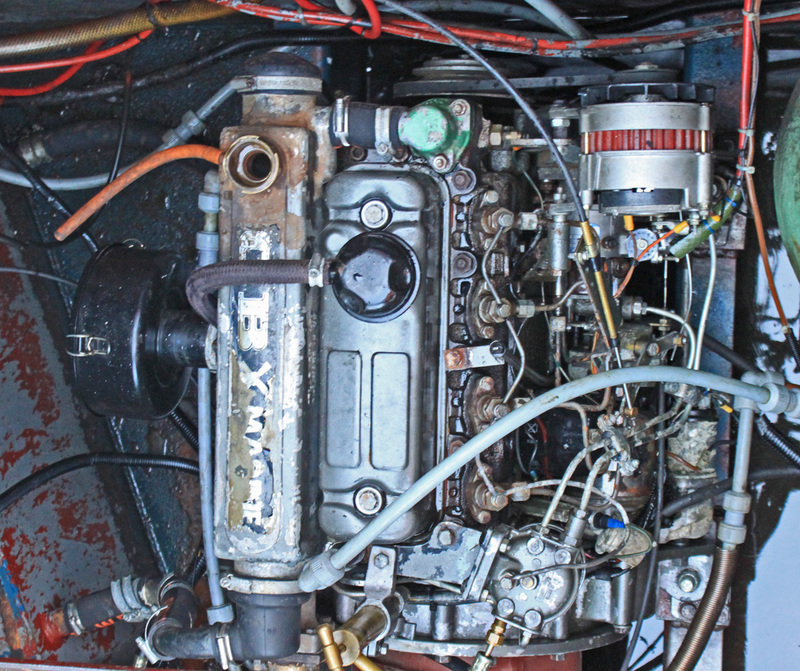 The trouble is that it involves gas, which is dangerous stuff in the confines of a boat and demands professional help. We have finally had the installation scheduled into the hectic life of the Calf Heath boatyard on the stub of the old Hatherton Canal. 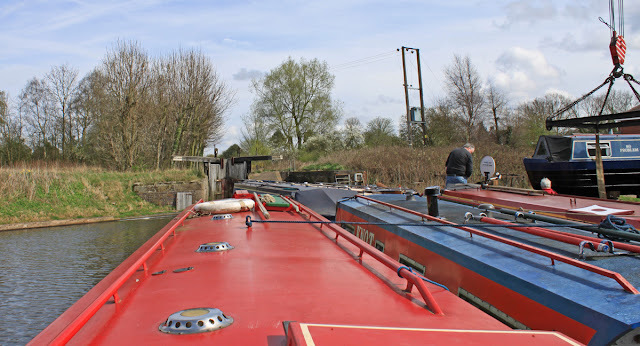 Saturday saw me taking the short trip up the private lock into the upper basin, to be greeted by Phil Jones who directed me to the right spot, three abreast just below the second lock on the canal. The first lock has been on trouble for years, leaking and very rickety and the owners have finally bitten the bullet and installed new bottom gates. These things don't come cheap - costing £15k for the build alone plus the fitting. Next time I wonder where my mooring fees go I will have an answer! Back next week to pick Wand'ring Bark up and then we are ready for out 10 day Easter cruise. 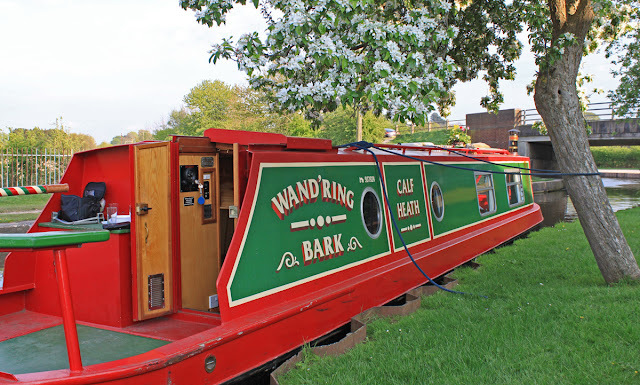 Finally, a night aboard Wand'ring Bark - the first of 2011. With Belle away watching Derek Jacobi doing his Shakespearean stuff, Jeff and I found ourselves with some time on our hands. 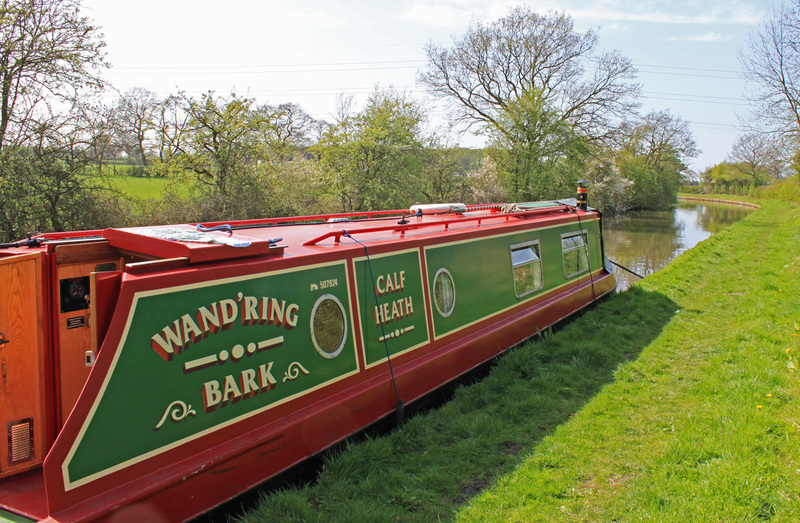 We had to go to the boatyard to pick up Wand'ring Bark after her new cooker was fitted, so why not take her out for a run and give her a shakedown in advance of next weeks trip? 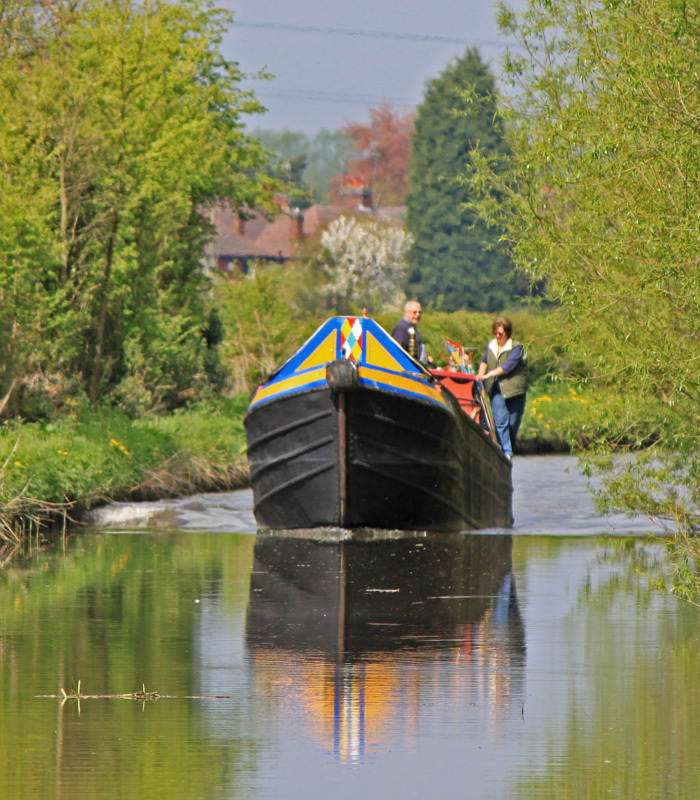 We stocked up with curry and beer and off we went, but only a mile or so down the cut to a spot well suited to a bit of re-blacking. Now I know re-blacking the sides is pure vanity, but after a hard years cruising the sides of WB are scarred and battered. A quick coat of blacking only takes a couple of hours to apply and suddenly the boat is transformed, all set for another season afloat till I haul her out of the water and do the job properly in the autumn. After a sublimely quiet night we were reflecting on the outstanding tasks and concluded that all was basically in order. Oh how wrong we were. Jeff emerged from the smallest room and reported that the flush wouldn't stop. He was right, something was wrong and a solution was needed, fast. The water valve on the toilet is tucked away and access demands the removal of the loo, so out it came. This sort of job never goes smoothly and I soon discovered that one of the retaining bolds had corroded away, which explains why the pan moves a bit under load. An inspection of the holding tank was not encouraging. It's nine years old and corrosion has set it. Its days are numbered but lets hope it holds out till next winter. 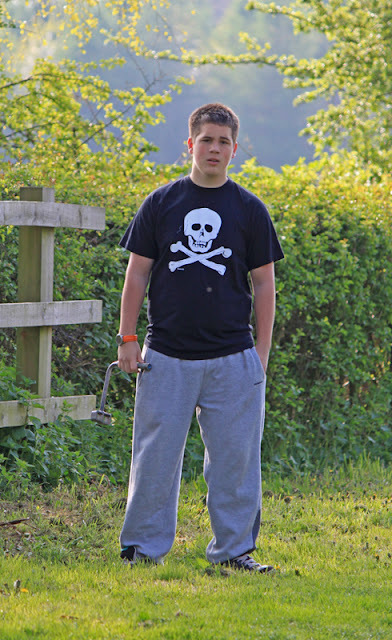 Then it was time to set about the Thetford dump through. I removed the valve assembly and discovered a twist of blue plastic which was obstructing the ball valve - a bit of debris which has found its way from the new accumulator. But one thing leads to another and the valve release mechanism falls out - which means unscrewing the whole toilet - only for the trapdoor mechanism to fall to bits. Two hours of trial and error later and we finally had all the bits back together again and functioning nearly properly. The loo is now unconvincingly attached with a single bolt till I get round to doing the job properly, and the pan has never been cleaner. I hate fiddling with toilets! The day was rounded of with a quick wash of the boat, the addition of a sparkling new chimney and Wand'ring Bark is all read for the off. 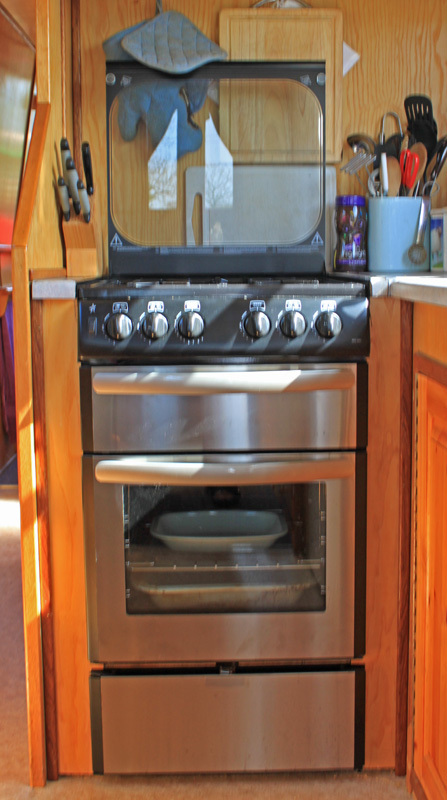 Stylish new cooker, gleaming paintwork, shiny black sides and, of course, a function loo. All in all a very satisfactory weekend spent under a clear blue sky with shorts and tee shirts being the order of the day. Roll on Easter. Following my review of "The Curious Incident" Bones sent me a copy of Extremely Loud and Incredibly Close, a book she felt I would enjoy as it was in a similar genre. To say it is an unusual book would be an understatement, but one which is very skillfully crafted. The book tells the story of Oskar Schell, a 3rd generation immigrant who suffers from an not really diagnosed condition, although one assumes it is a form of Autism or Aspergers. His Grandparents escaped from Dresden during the War. The family tale is by and large a sad one, with tragedies throughout the generations and the book takes letters from each party and allows the reader to builds up a picture of the entire group dynamic. Now Oskar lost his father in the 9:11 disaster, and the book is written two years later when the wounds were very still raw. Oskar discovers a key in a vase his dad had bought, which had the name Black on it. He figured he could get some peace if he discovered what was behind the lock and set about contacting every Black in New York, and hopefully through them identify which of the city's 19million locks it fitted. The story of the Grandparents gradual slip away from sanity and ultimate to separation was heart wrenching, it was so evocative I have to set the book aside in a restaurant or risk crying in public. The book carried a number of observant one liners, typified by the statement that "we are all like burning skyscrapers, all alight whether we admit or not and ultimately doomed - its just a matter of when". Cheery stuff given the nature of his fathers death. Lives are complicated, few have it all together and at the end of the day who is to say what is "normal". We are an eclectic rainbow of souls struggling through life, clinging to the wreckage and helping one another along the way. Then there is the style of the writing. Very quirky and creative - words, photos, diagrams all underpinned by a staccato delivery of a highly intelligent but unusual young boy. Not an easy good time tale, but one which is engaging and thought provoking. Well worth the investment of you time. Yes, thats right - I am 50 today. 12th April 1961 was an auspicious day in world history. Some say the big news was Uri Gagarin being the first man into space, but we all know that just as one man crawled his way off the planet a rather less assuming one crawled into it. I fact I am reliably informed that this great event took place between 6.00am and 6.30pm, so by the time I post this I will be nearly 50 years an 1 day old! 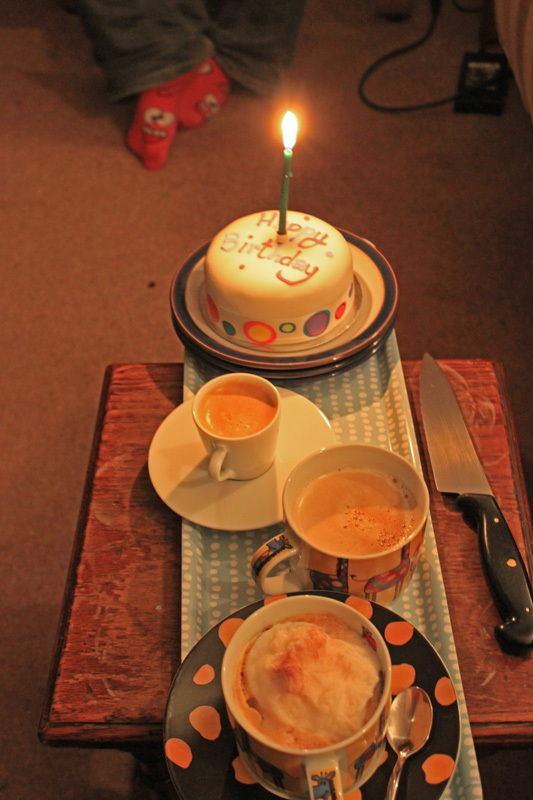 Birthday cake and coffee - no the knife isnt for wrist slitting! I embraced 50 with a certain amount of disdain, celebrating the day by visiting the dentist at 8.30am! Actually, I arrived early and was greeted by a chorus of "happy birthday" sung by the staff. Maybe it was all part of a sub conscious ploy to treat the day as any other. Celebrating a 50th birthday at work was more of a challenge. I now form pat of a virtual team and my colleagues are strung out across Europe, so I had to get creative and adopt some workmates to celebrate with. A tray of cream cakes seemed to do the trick. There is no big party for me - its really not my style. Instead we had a meal at our favourite Indian, then cake and coffee back home. 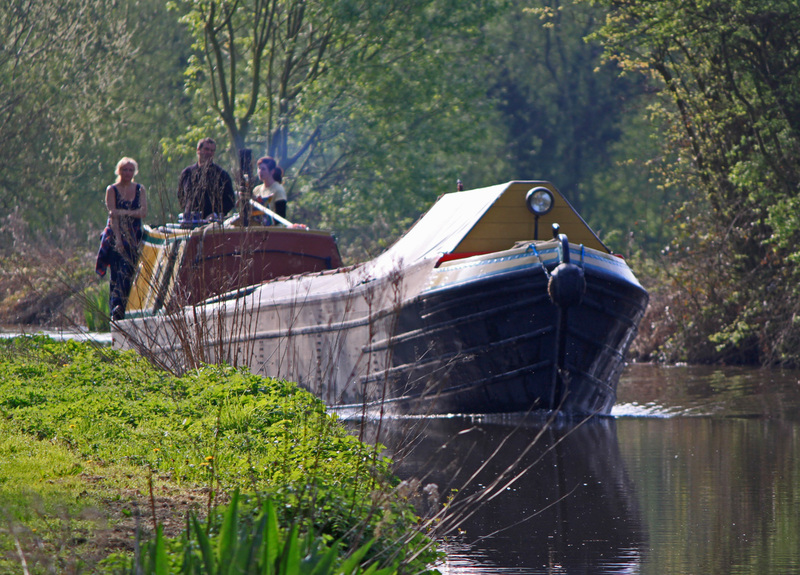 The real celebration is next week when we set sail for our Easter cruise round the East Midlands Ring. It will be the first real cruise of the season and the first holiday for a very long time. I cant wait. My birthday coincides with the flowering of my favourite plant - my much abused Magnolia tree. So here is to my 50's. I pledge to avoid the colour Beige, to try and maintain a constant weight, to retire before the next "big one" and to get in as much cruising as I possibly can with Belle. Visits to Stratford offer a happy confluence of interests in the Ahab household, with Belle interested in the theatre and myself more interested in the canal basin and he river. Belle can often be seen disappearing into the bowels of yet another bookshop leaving me to fend for myself, and somehow, almost by magic, I find my legs taking me in the direction of water. 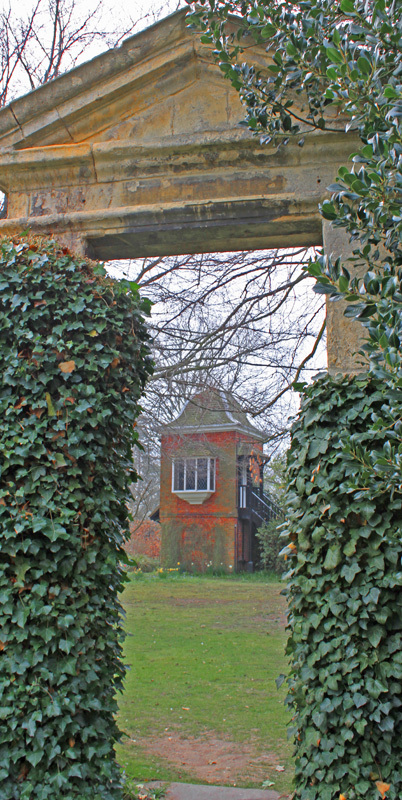 The Basin and surrounding gardens are a very pleasant place to pass the time, particularly now that the gardens have been transformed with picnicing very much in mind. But s well as the grass there are is a good selection of art and sculpture on display which offers some good photographic opportunities. The basin is still the mooring goldfish bowl it always was, but a bit more privacy can always be found by dropping down onto the river and mooring on the meadows. Halfie and Jan are on a tour of the BCN, and this offered a perfect opportunity to meet up. We settled on the Wolverhampton 21 as a suitable site for a rendezvous, with Shadow emerging from the dark bowels of the North Birmingham remaindered canals, and me making a dash across the Black Country after work. 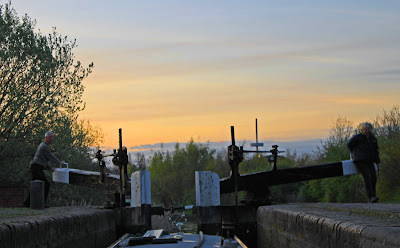 As it turned out Shadow was delayed by the inevitable crud round the prop, so Halfie and Jan entered the top lock at 6.00pm, just as I was driving round Wolverhampton's ring road. 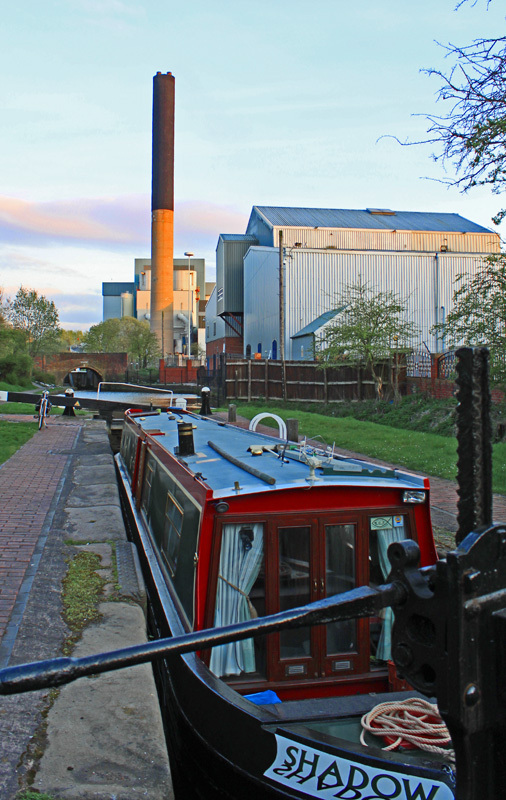 The plan was to assist Shadow down the flight so I parked 2/3 of the way down near the railway viaduct, a 15 minute walk back from the junction with the Staffs and Worcester Canal. I strode up the towpath, opening all the top gates I could and finally spying Shadow emerging from lock four. After some quick greetings I grabbed a windlass and off we went, hoping for a 2.5 hour descent and clearing the flight before the spring sun set beneath the western horizon. 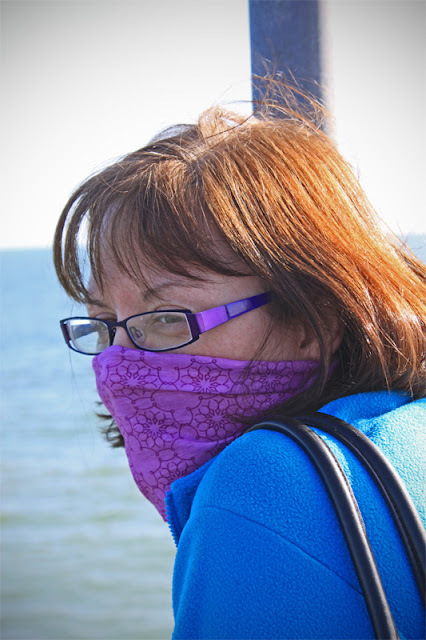 All went well till we reached the incinerator, when Jan smelled smoke. But it wasn't smoke from the huge canalside chimney, it was coming from Shadow. Jan repeatedly commented about the increased smoke in the locks and we finally lifted the deck only to be greeted by clouds of smoke and steam - the engine was cooking! The rocker cover was leaking oil and the level had dropped way down and the engine must have been getting tight. 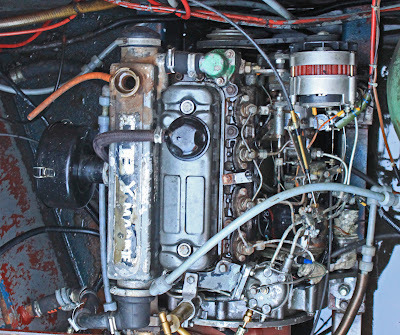 We grabbed a mug of tea whilst the smoke dissipated and then Halfie undid the coolant cap. How he managed to avoid the column of steam is beyond me - the guy has fast reactions as he dropped the cap and avoided a bad scalding. We replaced the water, topped up the oil and when the engine finally stopped bubbling and popping it was restarted and all was fine. Diesel engines ability to take punishment always amazes me. We restarted after about 40 mins but by then all the safety margin of time had gone. There was no way we could get to the bottom even by using every last ray of dying sunlight. There was nothing for it - on with the tunnel light. 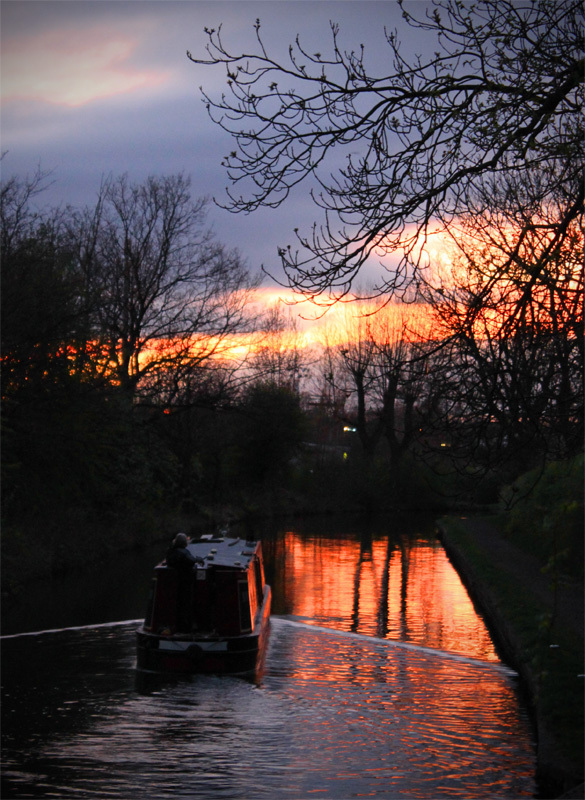 But it wasn't to be - the light wasn't working to we ran the last three locks in almost total darkness, finally emerging onto the Staffs and Worcester at 9.15. Out of light - doh! The evening was rounded off with a huge plate of sausages, bacon mushroom and mash, all washed down with a bottle of beer. Evenings don't get much better than this - boating, BCN, bangers and beer - all in the very best of company. Not written as I watch this time - praise be to Sky Plus! The show is over, its boosted my ratings of that I am certain! I have enjoyed this series more for its hands on exploration of the technology of 150 years ago than for its boating context. 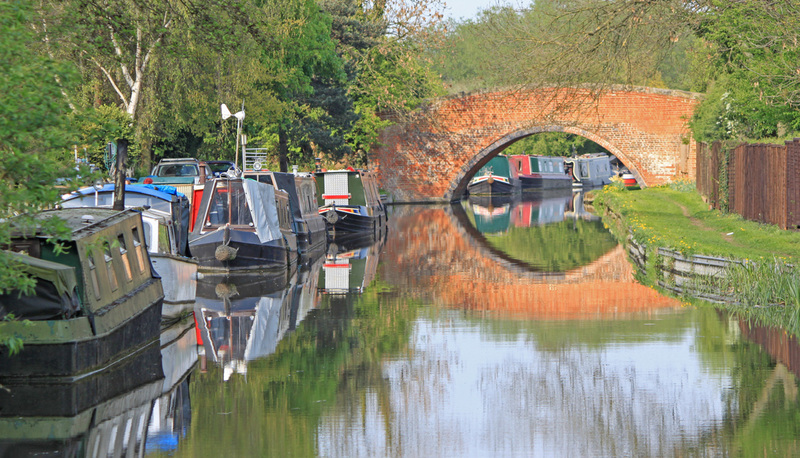 But that's OK, because part of my interest in the canals is my fascination with all things Industrial Revolution. This last episode went the way of many short series, with lots of retrospective reflection on what has gone before. In that respect there was a bit too much recycled footage and too little new material. Having said that, the new bits were were great. First there was the Victoria Sponge Cake making escapade which included DIY cow milking with Guy getting the wooden spoon for his crumbling effort which was proclaimed "edible" - faint praise indeed. Then there was the special darts board specific to Manchester, they are another throwback to an era past, and only 200 originals remain made out of solid Lime wood. Interestingly they have to be stored soaked in water or they crack. That sounds a bit too labour intensive for the typical boozer. Finally, and most interestingly, they had a crack at taking a photo using 1850 equipment. The necessity to pose for 4 or 5 minutes as the snow fell around them in Newark Marina made for a chilly experience, but the atmospheric end results were very impressive. 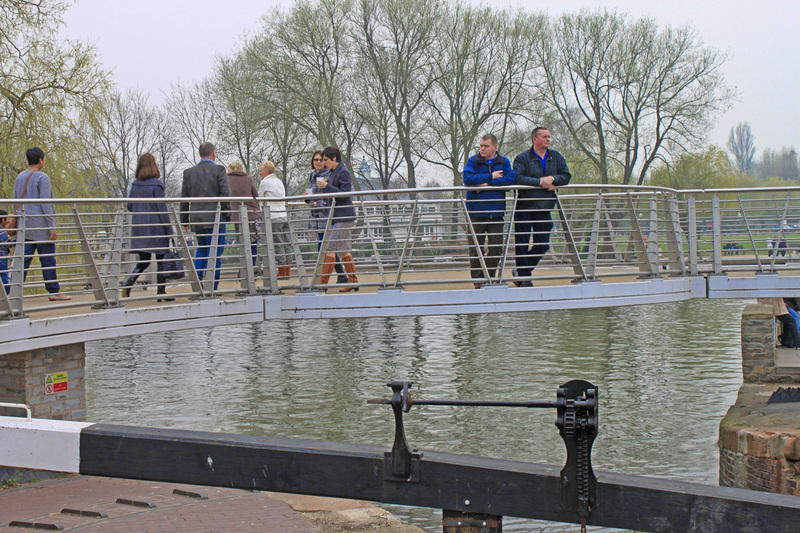 And so Reckless had its official opening with some of the people who have helped in their projects wading through the snowdrifts to see her in all her glory. The pot was examined as was the mattress, sheet, mugs, clock and all the other bits and bobs they have made. They may not have covered a lot of distance on the water but they have most certainly explored a lot of our industrial heritage. So, when I reflect on the series as a whole, I would have to say it was not quite what I expected but it over delivered in different ways. All in all a real success - well done Guy and Mave, I hope we see you again. As for Reckless, I understand that she is back at Seethay from whence she came. Whilst she may now be officially "built" I suspect that any new owner will be in for a fair amount of deconstruction before all those bodges can be put right. Suddenly we have a new destination in our lives. Jeff is based on the south coast during the term time so down we go on visiting duties. 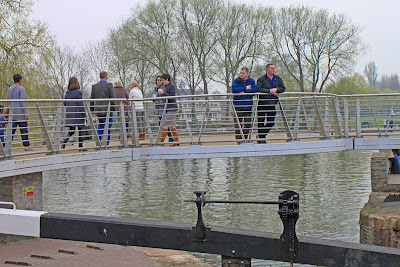 This visit coincided with the first warm weekend in March and suddenly the seafront which only three weeks ago was an icy wasteland, was thronging with visitors. 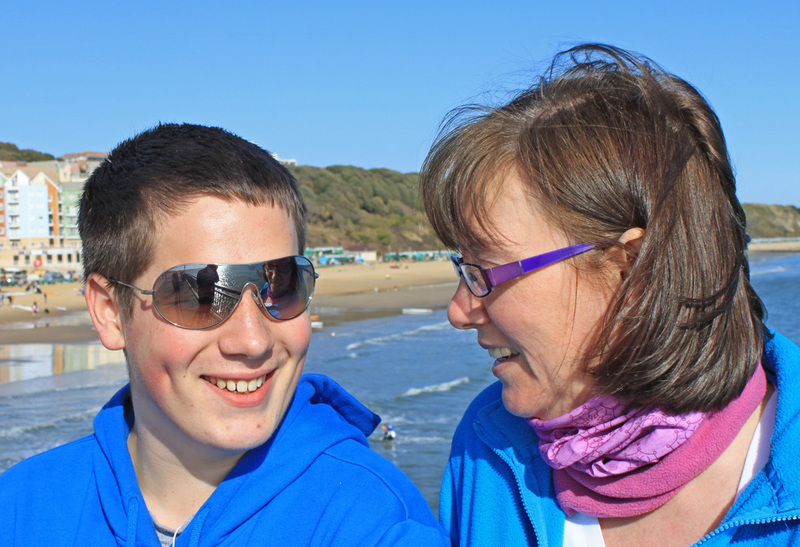 Cars milling everywhere, bikers vying with pedestrians on the seafront walk and a few hardy kids building the first sandcastles of 2011. With the water being little more than 7 or 8 degrees, you would assume it would be empty. But that's not the case. 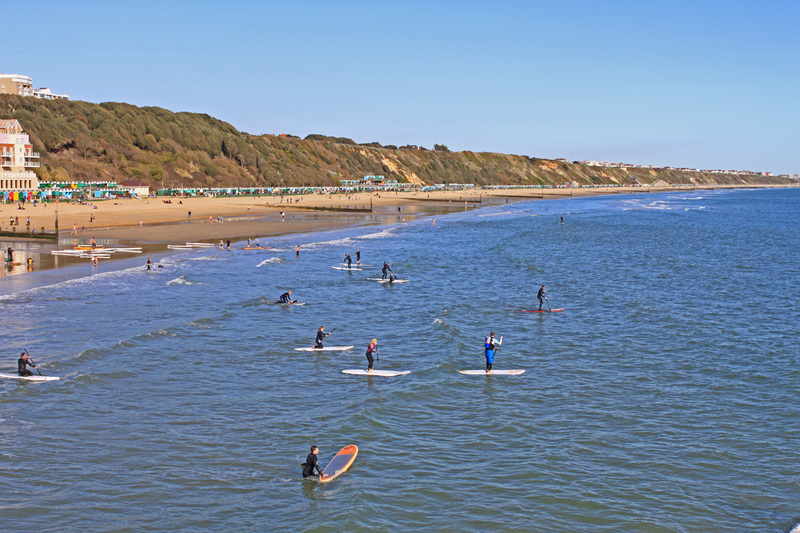 Boscome is a centre for surfing and even in March the sea was packed with wet suited surfers. 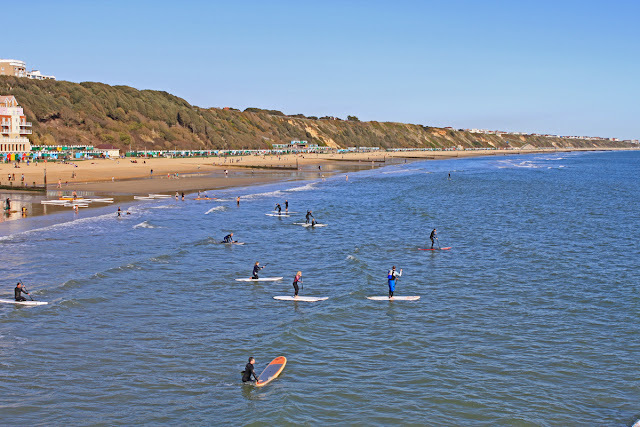 Thy were out there making the most of the modest swells that rolled sluggishly over the man made Boscombe reef. Fish and chip shop of the year 2010. This is both a take out and eat in restaurant in Womborne where, for £15, you can sample the "full monty". Fantasic fish and chips, mushy peas, a glass of beer, pudding and tea / coffee. This is an eating experience which really lives up to its hard won reputation. A beach front restaurant in Sandbourne. A competitively priced eatery which offers a full meal from a limited menu or a really tasty range of lite bites. The food is good, the restaurant clean and smart but perhaps the best thing is the view, straight out onto the beach with a sea view so long you can see the curve of the earth. A friendly little community church which makes you feel very welcome. We wandered in with Jeff on the strength of a recommendation and by the time we left we felt very much at home. Not only that - Jeff made friends and was delighted with his free jammie doughnut! 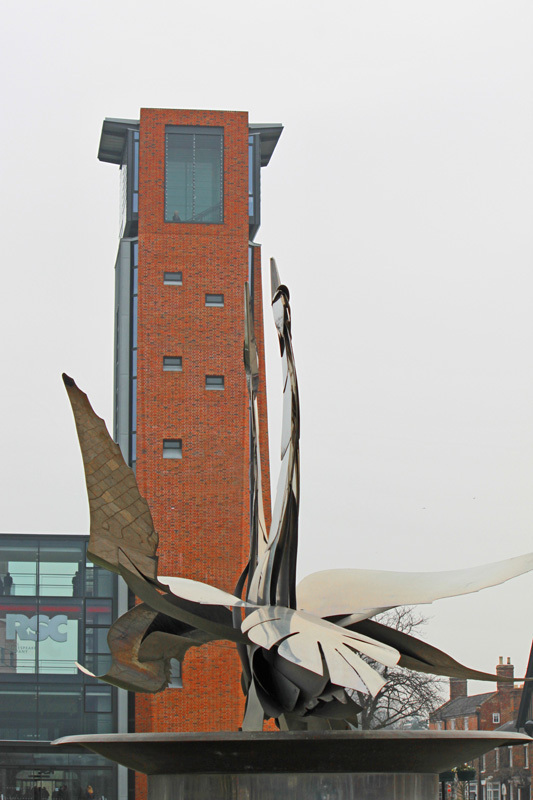 There is always so much to do and see in Stratford and sometimes its easier to focus on just a little bit. This visit took us to the Shakespeare Institute, part of Birmingham University where the specialist Shakesperian studies are delivered. 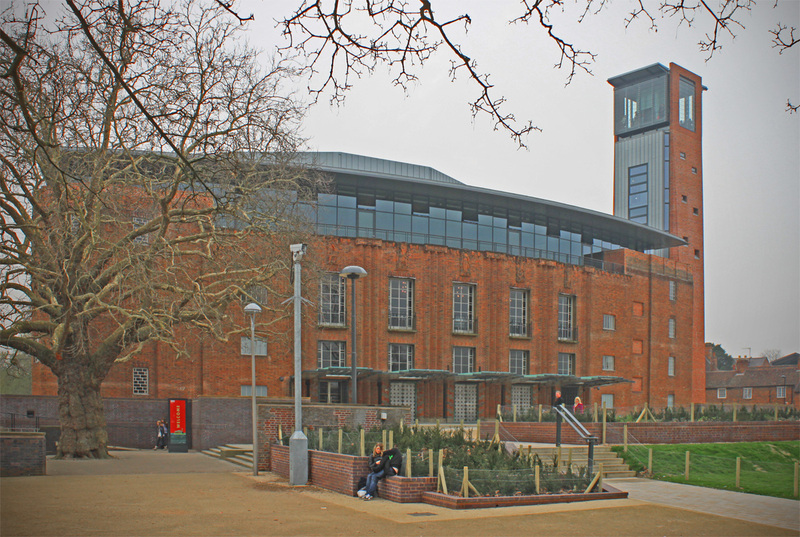 The Institute is a mere stones throw from the world famous RSC theatre on the banks of the River Avon, and to step through the portal takes you back 400 years to the time a young aspiring playwright boozed his evenings away. Belle has been a student at the institute for a couple of years and proudly showed me around the gardens, complete with the one up one down folly. 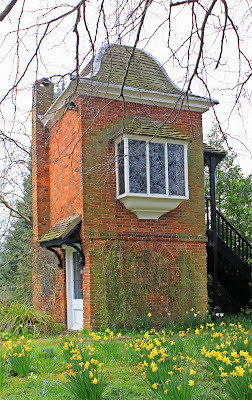 She tells me that if she ever leaves me she will live in this folly, but I suspect that the lack of a kitchen or toilet could be its undoing. The next stop was at the Guildhall Chapel where one of only three surviving Dooms is to be found. What is a Doom? I hear you cry. 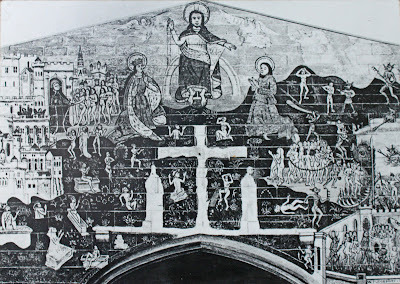 Well, is a painting which depicts heaven and hell and the selection process which takes place when the dead rise again on the sound of the final trumpet. 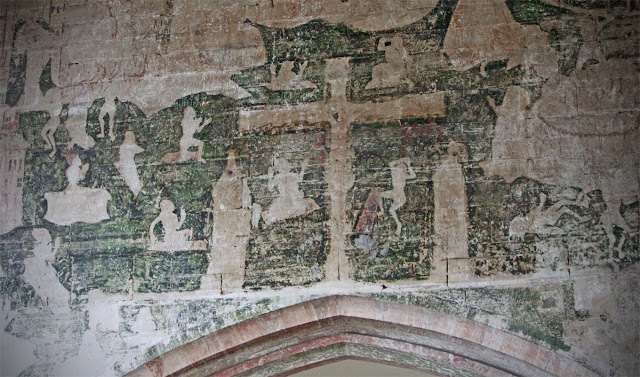 Apparently the doomed are led away by the bit of the body which brought about their downfall - which mostly appears to be the genitalia (no change there). I was struck be the graphic horribleness of hell, but the lack of detail about heaven. It seemed to be all stick and no carrot and the over riding message seemed to be "whatever you do, you want to avoiding going to the warmer option!". 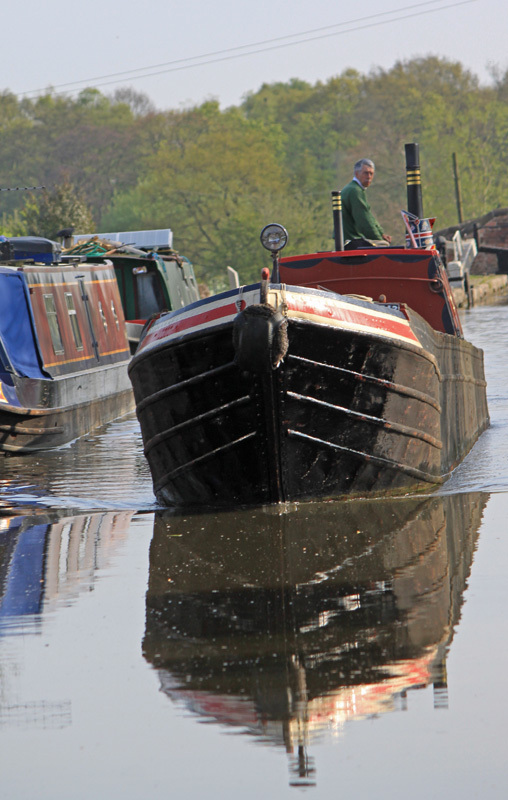 Whilst the network of tub boat canals which connected Shrewsbury with Ironbridge may have been largely lock free, they did have to traverse some hilly topography and through an area with very little surface water. 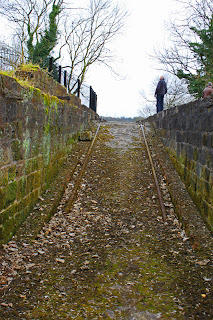 The answer was the development of the inclined plane, or put another way, railway tracks up a hill which carried either a water filled cassion in which a boat floated or, at Blist Hill, a cradle which carried individual tub boats. 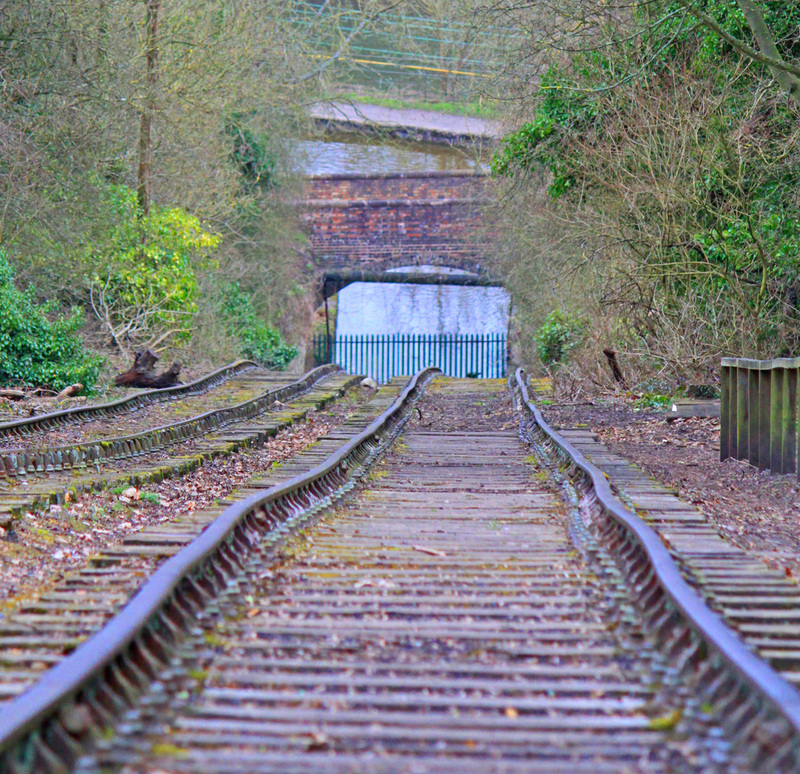 This area turned the inclined plane into something of an art form, with four of them in the vicinity. The Hay Inclined plane is the only one which survives, set at the southern tip of the Blist Hill Museum site. 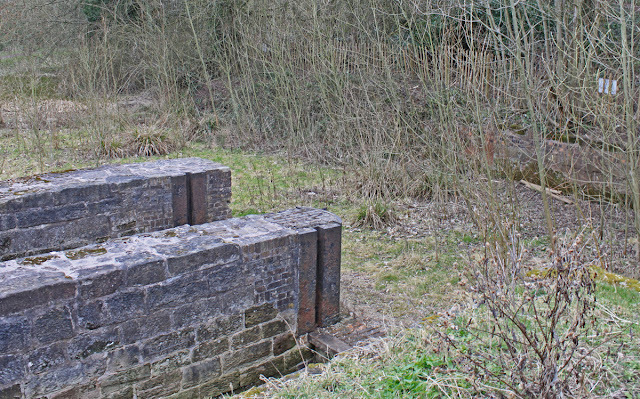 The slope carried tubs down over 200ft to the Coalport Canal below, and then into the River Severn. This plane is in good repair, offering a good idea of how it looked in its heyday. 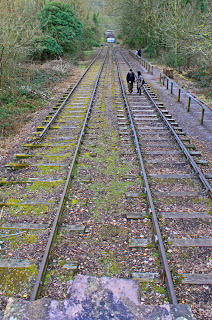 True the main rails have been replaced with incongruous BR cast offs, but their placement does offer a sense of scale and proportion to the location. 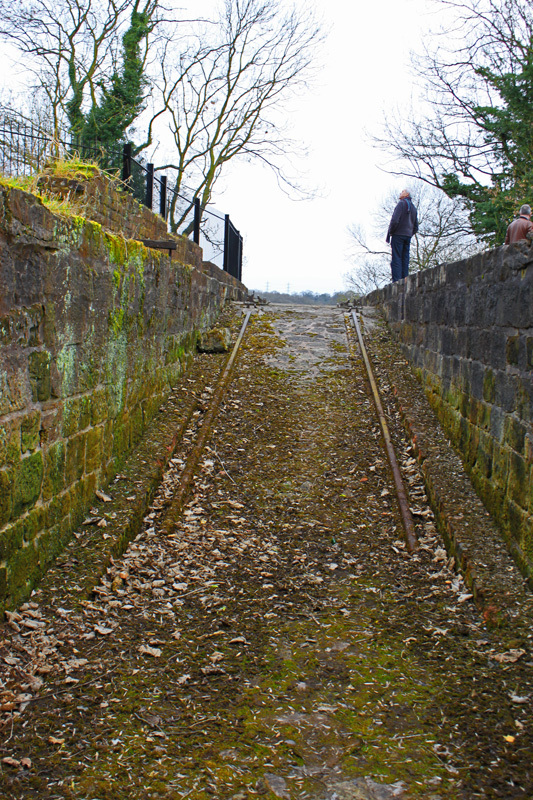 For the purists (and I had two serious rail buffs with me) a close examination of the slop into the canal bed at the top revealed original cast iron rails. Most of the energy used to move the tubs will have been by gravity, but the remains of a boiler house remains which was used to help when needed. 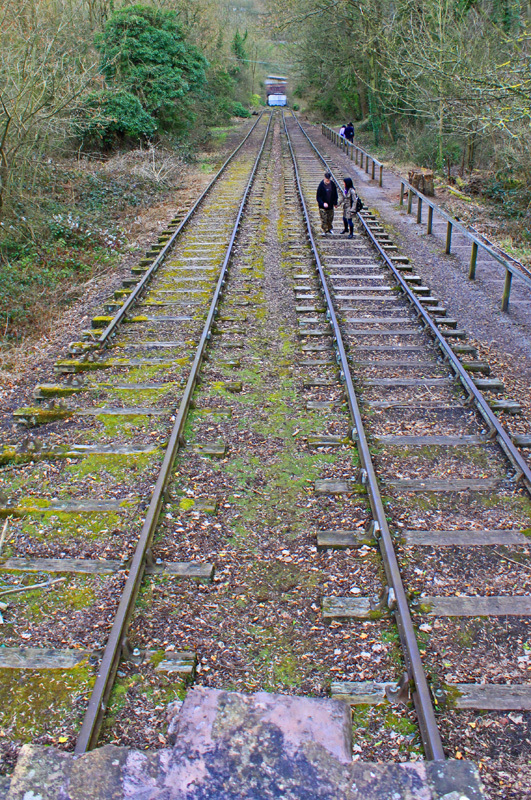 Some inclined planes were short lived and unsuccessful, like that at Foxton on the GU Leicester Line, but this one was a big success - operating for over 100 years between 1792 and 1894. 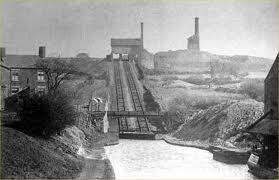 The other notable inclined plane on the system was at Trench, near Newport. 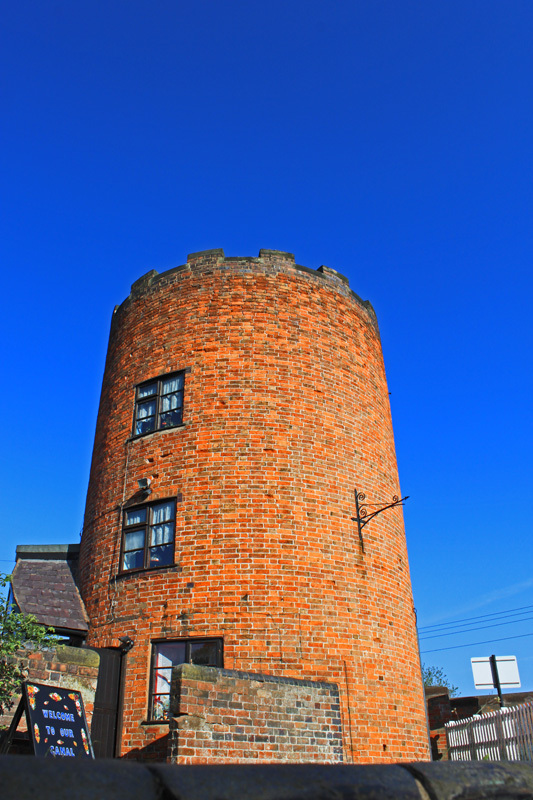 This operated commercially till the canal closed in the 1930's. This was lost under the Telford sprawl, which is what has happened to most of this remarkable network. On surprising feature of the site is the remarkably tight turning space at the top of the lift. To one familiar with the dynamics of a narrowoat it seems impossibly short, but the tubs were only about 20ft long and carried a 5 ton load, so didn't need a lot of space. 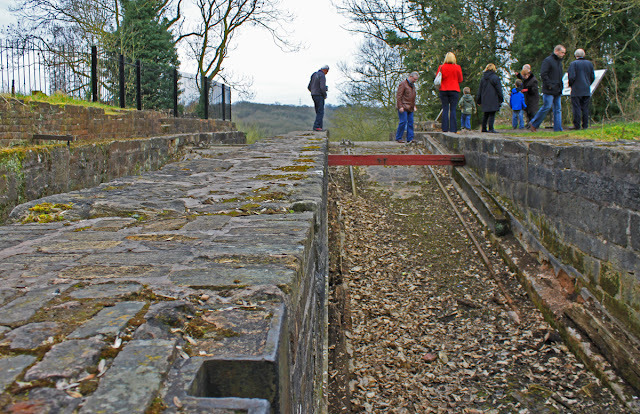 This location offers a rare opportunity to see an inclined plane layout, all preserved as a scheduled ancient monument. I was unimpressed by the last Grisham book I read (The Broker), so I wasn't overly enthusiastic when Belle presented me with a copy of Theodore Boone which she had picked up in a three for two deal at Waterstones. In the event I was pleasantly surprised. The book was an easy read - possibly too easy. 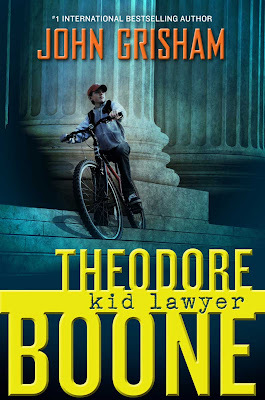 The plot line is based on Theodore Boone, a 13 boy with a fascination with the law. Both his parents were lawyers and his idea of a good time is to hang around the city court house. Such was his obsession that he knew as much law as many lawyers, and everyone at the court knew him. All this history came in handy when a murder case was held. The consensus was that the accused was guilty but there was no real evidence. The guy would go free. Then a surprise witness emerges who could ensure a conviction, but he wouldn't testify. Young Boone was jumped from observer to player in one meteoric step. Of course, justice wins out but how? You will have to read the book to find out. 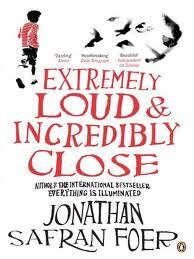 Now I said that this book was an easy read and it strikes me that the book was written about a teenager for teenagers. I was through the 250 pages in no time, well 24 hours anyway. Strangely, whilst it was Grisham 'lite' it was also engaging and I was sorry when the end arrived. The good news is that I can recycle the book - it is right up Jeff's alley. So, its a good book. Different, light, but totally readable. Just remember to pack another book cos this one wont last you long.